In early April, we will begin fishing at St. Joseph, a renowned port for spring Salmon and Trout fishing. During this time of year, the salmon and trout flock to these waters to feed on the excessive baitfish in the area. The early spring months when the water is cold, typically bring greater numbers of fish (Coho Salmon) but these are typically smaller in size. 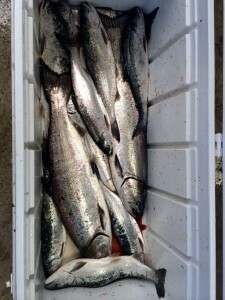 Brown Trout, Lake Trout, Steelhead, and King Salmon are also caught, but Coho is the primary in mid-April. Many people believe Coho Salmon are the best eating fish of the big Lake Michigan because of its flavor and tenderness. In May as it warms up there are mixed bags caught often. Dates normally fill up fast so book your trip today. Once your charter is confirmed, a $100 deposit will be required to hold the date. Thank you!